A word of advice if you’re planning your getaway at Timber Ridge RV and Recreation Resort: charge your phone. Make sure to keep it charged. You’re going to be taking a lot—and we mean A LOT—of pictures of your adventure here. In terms of a true “Up North” getaway, this place really has it all. For starters, there’s the lodging. Whether you’re a “city slicker” who wants all the comforts of home or a “Daniel Boone” (Google it) type who craves something a bit more rustic, Timber Ridge accommodates these and everything in between. The resort offers full hookups for larger RVs. Most sites in the resort are pull throughs, making it easy to get your rig in and out, as needed. 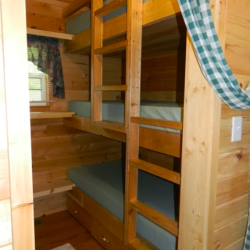 The resort also offers a variety of accommodations, ranging from basic and deluxe cabins and cottages that sleep up to five comfortably, to spacious bunkhouses that can accommodate up to 11 people. The deluxe cabins and cottages have kitchenettes with all the essential utensils, plus a refrigerator, and a bathroom with shower and toilet. 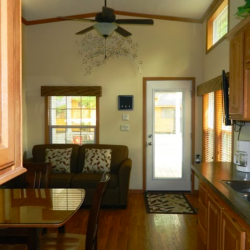 For a step up in comfort, the resort also offers rental parkhomes that sleep up to six, with a full kitchen, bathroom with shower, sink, and toilet, bedroom with a queen bed, plus more “personal space” for everyone. Campers who want to get a little closer to nature can rent one of the resort’s Pacific Yurts or bring their own tent. While Timber Ridge is close to many of the area’s activities and attractions, many campers here simply choose to stay put. It’s easy to see why…the resort has so much to see, do, and experience right here in the spacious campground. It features a large, outdoor pool, a popular attraction on warm, summer days. The resort also has a huge playground and bike park, perfect for the little and not-so-little ones to stretch their legs and have some fun. Guests can sign out basketballs, volleyballs, and other equipment and games for free. 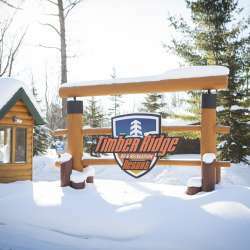 Timber Ridge also rents our 3- and 4-wheel turbo bikes, fat tire bikes, golf carts, and more. The resort also borders the VASA Trail, which is a scenic, unpaved trail that’s popular with hikers and cyclists. Perhaps one of the biggest draws to Timber Ridge are the many events it hosts throughout the year (it’s open year round). There’s something going on almost every weekend, especially in the warmer months, offering families many options to help keep boredom at bay.